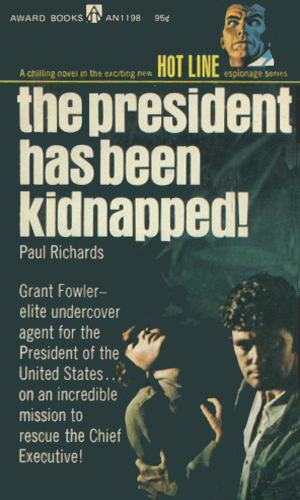 Grant Fowler is an agent working directly for the President. A roustabout for much of his adult life, Fowler has held many jobs prior to being hired by the President, including being a barker at a carnival. His greatest love seems to have been flying, although the number of accidents he has had would make you wonder. While in his late 30's, Fowler was involved in a disastrous airlift of needed food and medicine to Biafra. Though this noble gesture nearly cost him his life, it did bring him to the attention, apparently, of the President and eventually the job as one of the several Special Agents. Fowler is the proverbial blunt instrument. He pounds his way in, around, and finally out again. The listed author, Paul Richards, is a house pseudonym for Award Publishing. The actual authors of the three adventures were young writers getting their start, two of whom had written books in Award's far more popular series, Nick Carter. The fact that two different authors worked on each book probably added to the unevenness of the series. The first book is a disaster. Fowler is an overbearing, oversexed lout with little redeeming qualities. By the end of the adventure, with Fowler beaten and shot and close to death, it really was hard to care which way it went. In the second adventure, the storyline improved. Wanting to create a more enjoyable scenario, the author has the Presidential Service establish the cover of an up-and-coming international entrepreneur. Fowler is now the head of a chain of resort hotels around the world and is looking to buy into an airline. Though his financial status was changed, however, his brusque, no-nonsense, demanding approach to everything remains. Still, it was an improvement. The third and last escapade sees Fowler actually enjoyable to follow. His manner is almost normal and his actions are believable. 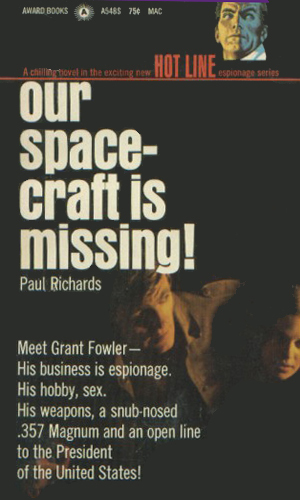 Someone is destroying the spacecraft sent into orbit by both the US and the Soviet Union. Each suspects the other and the Soviet Union vows that should anything happen to its next ship, there would be devastating consequences. Air Force One is hijacked and flown to a dictatorial Caribbean nation to make it look like an American attack. Unfortunately, the President, thought to be vacationing, was onboard. Grant Fowler must get it back before the President is discovered. 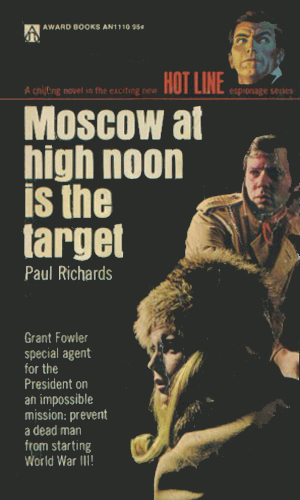 An elite group of former special forces soldiers has banded together as the Brigadiers and have staged startling audacious robberies in several Iron Curtain nations. Moscow vows that if the Brigadiers were to strike again, there would be war. As I indicated in the section above, the series is terribly uneven. Fowler starts out as a near-total jerk who isn't fun to follow at all. Then in the next book he is a good agent that has many redeeming qualities and has lost the chip on his shoulder. The third and last book is very good and Fowler is someone you could almost like. This series does show the danger that comes with a stable of writers working on character, especially a brand new one. In many cases, the series was created by one person who has either written a "bible" to follow or, better yet, written the first book(s) as a starting point, with the other authors following the blueprint. In the Grant Fowler case, it is obvious that neither happened. There was no founding author nor, it would seem, was there a good blueprint other than "here's an agent. Do agenty things with him." I do not blame any of the authors, all of whom were learning their craft and probably just following orders. That doesn't help the poor reader, though.